Professional Learning Examined: The importance of professional learning or professional development has been emphasized in the Every Student Succeed Act (ESSA) and has been at the forefront of many districts’ and schools’ planning efforts to improve the necessary knowledge and skills of teachers and leaders that create a well-rounded education for our students and that prepare them to meet the challenging academic standards. 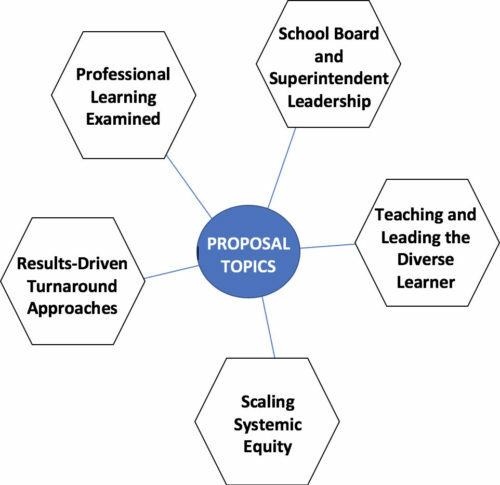 This strands invites proposals where districts, organizations, and/or schools 1) have addressed and solved professional learning challenges, 2) have established a pathway for seeking micro-credentialing or competency-based professional learning status, 3) have utilized technology to advance or change how professional learning is implemented, and 4) have utilized a sound professional learning program that has changed the academic, social, and emotional outcomes for students. Teaching and Leading the Diverse Learners: It is the responsibility of schools and districts to create a school culture and instructional climate that embrace the growing diversity found within our schools and communities. What specific, proven, programs, practices, or strategies are yielding great results with minoritized students, specifically students of African descent, in our classrooms. Proposals should clearly explain, illustrate, and apply how schools and districts are answering these and alike questions to lead, teach, remediate, support, innovate, prepare, and/or educate the diverse and unique populations (special education, early childhood/elementary, LGBTQ, families in poverty, DACA, trauma, African-American girls or boys, gifted and talented, middle or high school students, student transition from high school to college) of our schools. Strands that are supported with proven results will receive strong consideration. improve student achievement in low-performing schools. Proposals that offer processes that will help educational leaders to develop practices and policy alternatives for immediate implementation in schools are encouraged. Scaling Systemic Equity: This strand highlights the individual schools and districts who have demonstrated that the links between poverty, race, and educational outcomes can be and have been dismantled. The call is for districts and schools who have moved the needle of scaling systemic equity approaches to addressing and eradicating the historical failures to educate our students. Proposals may address principles that can be used to design institutional structure and to stimulate practices that results in large-scale improvement and how schools and districts have organized and aligned processes, practices, structures, and culture to accelerate the urgency at all levels to do “whatever it takes” for every student to achieve success in school. Research Roundtable Abstracts: This strand calls for current research (theses, dissertations, action research or projects) proposals that address the NABSE mission to produce research that identifies educational practices that demonstrate excellence in the school performance of African American studies. Abstracts should clearly adhere to and speak to the NABSE mission and purposes. Using APA, the Research Roundtable abstract should include the following relative research information: the problem under investigation, the participants, essential features of study method, basic findings, and conclusion and implications. This abstract should be attached in an email before or on June 1, 2019 and emailed to proposals@nabse.org.